This past week I had the opportunity to see this exhibition with a tour from curator,Dirk Van Tuerenhout and it was fascinating. I don't consider myself particularly religious and was, therefore, prepared to be polite. The story of Guadalupe is intriguing to say the least. It is well worth the visit and should not be missed if you are in Houston. 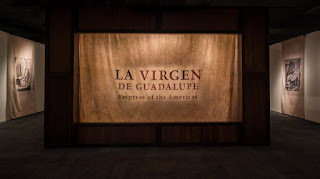 La Virgen De Guadalupe, a limited engagement exhibition, retraces the history of the Empress of the Americas. Its storyline covers more than thirteen centuries, divided into five sections. We start in 8th century Spain and end in the 21st century Americas. In between is a long, complex and extremely interesting story of deep faith, conquest and conversion, a clash between two very different worlds and contemporary expressions of devotion to the Virgin. The story starts in the Iberian Peninsula, at a time when Muslim forces have overrun most of the territory. Over the next eight centuries, Catholic kings ruling the northern edges of the Peninsula fight to reconquer these lost lands. During this epic struggle, in the early 14th century, a new empire rises in Central Mexico, that of the Mexica, better known to us as the Aztecs. In 1519, these two worlds meet and are forever changed. According to deeply held beliefs, during the later years of Aztec history a humble individual by the name of Juan Diego was born. In the year 1531, he was the person to whom the Virgin of Guadalupe revealed herself. This meeting, and the subsequent decision to build a chapel on the spot where this event occurred, have had far-ranging effects on the history of this part of the world. Over the next three centuries, the Virgin of Guadalupe becomes ever more popular, gaining in adherents as well as influence. At the dawn of the modern age, with independence looming over the horizon for many Latin American countries, the Virgin’s role transcends that of pure religion and extends into the political realm. The exhibit closes with a display of contemporary devotions to the Virgin, and the story of the canonization of Juan Diego by Pope John Paul II. La Virgin De Guadalupe: Empress of the Americas opens Dec. 11, 2015 (the day before the Feast Day of the Virgin of Guadalupe), and runs through Sept. 5, 2016. For tickets or more information, visit www.hmns.org or call (713) 639-4629. 2. NEW YORK — African art rarely thrives in the Western art museum. It hovers uncertainly between the beautiful or intriguing object and the ethnographic specimen. Exhibitions are relatively infrequent, so audiences have little opportunity to develop the right receptors, and base knowledge, to make sense of it. When African art was not trumpeted as primitive, it was radically decontextualized. One of the best early 20th-century American collections of African art was gathered in the museum created by Albert C. Barnes outside of Philadelphia, where curatorial whimsy placed it alongside early 20th-century modernist painting. Even today, African art is still put to demeaning uses, as in the Smithsonian’s “Conversations” show, in which pieces from the museum’s magnificent African collection are put in trivial “dialogue” with American art from the collection of the recently arraigned Bill Cosby. As a magnificent exhibition at New York’s Metropolitan Museum of Art draws to a close, however, it’s clear that not only can African art speak intelligently and viscerally within the Western art museum, it can destabilize the underpinnings of the museum itself. “Kongo: Power and Majesty” ends on Jan. 3, but will remain vivid for all who have seen it. The show’s success, as with most successful exhibitions, is based on two things: depth and honesty. It gives visitors enough material to engage the faculties of distinction and differentiation, and it confronts the curatorial challenge of its subject without flinching. That challenge is felt in the first and last rooms of the exhibition, which begins with a limestone column placed near the mouth of the Congo River in 1483 by the crew of the Portuguese explorer Diogo Cao, credited with “discovering” the Kongo region on the west coast of Africa. The column’s survival is almost miraculous, but no less so than the artistry of several oliphants seen nearby. These carved ivory horns — made more for display than musical purposes — are deeply but delicately incised with geometric patterns, often spiraling in wide bands down the length of the tusk. They were prized by Renaissance collectors, who added them to the “wonders” of their Kunstkammern (the Renaissance forerunner of the modern museum). 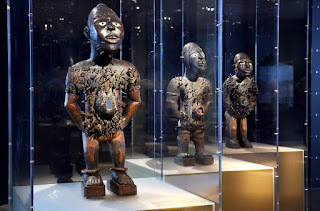 At the end of the exhibition is a room of very different material, a stunning collection of 15 Mangaaka, or male power figures, with short legs, powerful arms, hands resolutely on the hips, and torsos and heads studded with nails, blades and other hardware. The casual visitor may assume that these two species of material culture were made by different peoples or that some horrible decline in aesthetic values intervened between the age of the luxury objects made for European export in the 16th century and the 19th-century power figures, which seem to amplify ideas about the land of fright. Perhaps it would have made more sense to make this two exhibitions, one about the initial encounter with European civilization, when the Christianized Kongo kingdom enjoyed relative equality and prestige with its Portuguese trading partners, and the other about the art of the 19th and 20th centuries, when Kongo had been effectively absorbed into the miserably exploited colony of Angola. But the success of the show is its unflinching look at how African objects migrated through Western categories and institutions, at the depredations of the slave trade that corrupted every political and ethnic relationship in this region, and ultimately at the huge lacuna in our knowledge about the Kongo people, which is all the more distressing given that Kongo is one of the best documented kingdoms of Africa. The result is a powerful visual and emotional demonstration of an old idea that is so painful, and incriminatory, that we would love to dispense with it: that the entire structure of Western thinking, political and economic hegemony made it impossible to see Africa. Westerners could discover it, lose it, repurpose it and exploit it; but they were never interested in making sense of it. That meant that as the power of pure wonder faded, and our classification system divided art and science, the natural from the human-made world, many of these early Kongo artifacts ended up in ethnographic museums, where they were wildly mislabeled. Was it from Africa (already a ridiculously large category) or Southeast Asia? What difference did it make? By the early 20th century, there was renewed appetite for (if not genuine interest in) the art of Africa and Kongo, but the categories had changed. Collectors sought the primitive, the “pure expression of the emotion of a savage race,” as the 291 gallery curator described it. The male power figures, with their forceful, even threatening posture and the apparent violence with which they have been studded with metal, might seem to fit that bill. Co-created by artisans who carved the wooden figures and priests who empowered them with spiritual force, they were not merely “war fetishes” as European observers believed. They were endowed with the power to record contracts, settle disputes, dispense justice and enforce what we think of today as the stability of civil society. The metal driven into them might signify a specific resolution of conflict or agreement between parties. What seems to an outsider a mark of violence was in fact a response to violence, an enactment of civil healing in a society that had been reduced by colonial exploitation to nearly intolerable instability. So by the end of the exhibition, it may seem as if the old dichotomy between the artistic object (the beautiful carved tusk) and the ethnographic object (the sacred power figure) has been reinforced. In fact, the old dichotomy is now radically undermined, calling into question the definition of art itself. Is it the elegant object made for sale or presentation, exchanged among and preserved by elites? Or is it the object that has what we might call pragmatic spiritual power? Take those questions with you as you visit the Western galleries of the museum, and you will see everything with a liberating sense of confusion.